Posted byMei 28 April, 2011 19 May, 2018 14 Comments on Is steroid cream safe? In my post on “Are you suffering from Steroid-Phobia?”, I have encouraged parents to be open to using steroids under the doctor’s supervision. My baby girl Marcie has taken a one-time 3 weeks oral steroid course and has been applying steroid cream prescribed by her specialist doctor, like the o.1% Elomet Cream. For parents fearing the use of too potent steroid, below is a potency ranking chart from National Skin Centre’s website. Tubifast 1.4 Tubular Bandage #2434 (Red Line)""
How to Shower your Eczema Child? Hi Mei, my 3 month old baby is having very dry skin and rashes ans itchiness at whole body, face and scalp which is eczema. After i found your post, i want to try elomet cream on my baby. I just want to know should i apply QV cream first or elomet cream first? Can you share with me how you take care of baby’s eczema? Appreciate your effort to share with your view and experience. Thanks a lot. Hi Maryam, thanks for dropping by my blog and sorry to hear of the eczema. Have you been prescribed elomet cream? For 3 months old, you may wish to start off with the lowest potency steroid cream (liquid hydrocortisone cream) rather than Elomet. Do see a pediatric dermatologist and also take allergy test to identify triggers (the common ones such as dust mite, egg, milk, peanuts, cats dander, dog dander) are tested for skin prick test. If the normal skincare is not done correctly, then even with steroid cream, the dry skin will still remain and be itchy.. Thank you so much dear Mei. Really helpful. I will follow your suggestions. No, I have not seen ped for he only prescribed Aqua cream which is very low effectiveness. But I intend to meet him soon. So i am start applying QV cream for my baby and see how it goes. It’s important to protect the skin from young as increasing research are showing the possibility that a defective skin barrier can lead to food allergy (as opposed to conventionally when it was thought food allergy causes rashes). what about the redness of laser operation , does it effect on that or no ?? i did a laser operation the then i misused wrong cream then my face got redness all the area that i did laser on since three months till now redness still on myface !! No experience with that, but I guess that after a laser, your skin is more vulnerable and thus more exposed to ingredients in the cream you use which may normally not irritate. Hi Mei, your blog is very informative! Thanks for sharing your experiences and I think you have done a good job for Marcie. 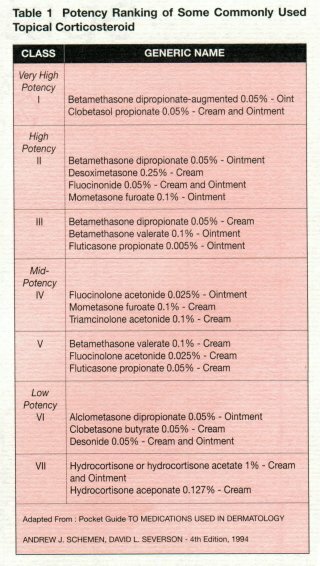 Anyway, could you tell me which are the steroid creams that you are using of different potency (besides Elomet)? My 2 year old daughter has quite serious eczema and I am only using Fucicort cream as prescribed by her GP. I can’t quite remember the charges, but I think it’s standard fees for different grades of consultants and whether by referral/not. Can simply call up NUH to ask. Whether or not eczema kids need to go through skin prick test depends on the conversation you’d have with the doc, say you suspected some foods, the condition is more than mild case, based on family medical history – it may be a good idea to investigate further the allergens. Personally, I’d say go for it just so to have some ideas on how to manage the eczema going forward. My baby Marcie’s doctor is Prof Hugo Van Bever at the NUH. You can call 67722002 for an appointment, Prof Hugo is from department of Paediatrics.